In Ancient Polynesia, when a terrible curse incurred by the Demigod Maui (The Rock) reaches Moana’s (Auli’i Cravalho) island, she answers the Ocean’s call to seek out the Demigod to set things right. Typical Disney. But it still hit the spot. The animation was stunning. Beautiful to look at. I just wanted to dive into those clear blue waves. Yes, I know they weren’t real! BUT that’s how good the visual effects were. The opening song numbers weren’t too bad. They set up the story and established Moana’s background perfectly. Torn between exploring the world and fulfilling her duties as the new Chief of her people. The running theme of identity and personal being was an intriguing one as the deviant Moana opposed her father’s numerous attempts to keep her on the island. The Hawaiian folk lore and supernatural guff was entertaining enough. The cheesy singing and mad journey was fun. BUT I was a little disappointed with the songs. They weren’t really that memorable. Don’t get me wrong, they were easy listening gems and Cravalho has a lovely voice BUT I could only remember two tracks off the top of my head while writing this. There was certainly plenty of humour and heart. A gag involving tweeting drew a guilty grin from me. A predictable journey lifted with some fantastic supporting characters from Hei Hei, the special chicken to . . . The Rock. My God. 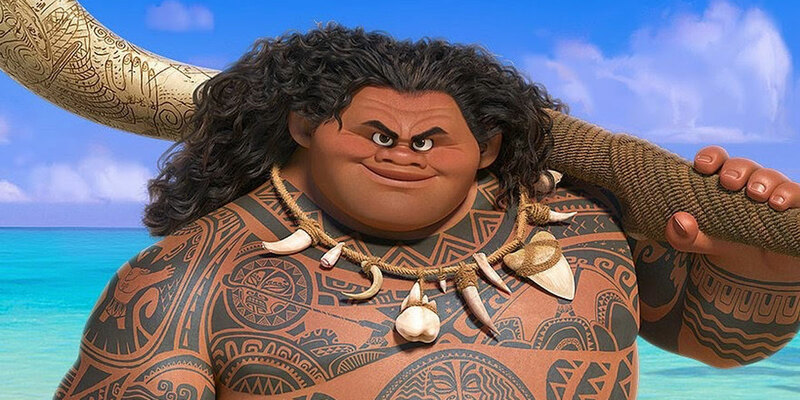 He stole the show as Maui. The guy is a demi-God. Let alone voicing one. They must have had him in mind from the get go as the tattoo woven, bicep flexing, eyebrow raising (They even included the Brahma Bull’s brows) machismo. His conflicted character had me in stitches. I loved his little tattoo. A Jiminy Cricket running around all over his body to let the big guy know when he’s making a big mistake. Brilliant. And who knew the big guy could carry a tune? Any WWE fan will know the Rock can sing. I didn’t think I’d throw that into a review any time soon. You’re welcome. See what I did there? Just when I thought the pace was beginning to lull and Moana was thrown into the water by Maui for the umpteenth time, thankfully there was a new challenge or foe to keep things going. I didn’t expect Flight of the Conchord’s Jermaine Clement to appear in this. Applying his David Bowie-esque gravitas to the troubling Tamatoa. Shiny, shiny! He was hilarious as the conniving crab. As much as I was entertained, for all the hype, Moana just didn’t stand out. The journey was all too predictable and normally I’m one for the ride NOT the destination BUT it just didn’t quite hit those highs for me like her Disney predecessors. Moana was a resilient and resourceful heroine BUT her character seemed to get a little lost in the ever-growing Disney universe. BUT this is coming from a cynical man reaching his thirties so make of that what you will. 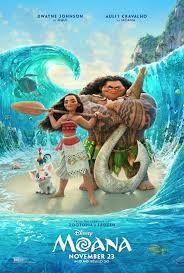 It killed the time, the animation was amazing and the True Grit dynamic between Moana and Maui was a nice touch. So despite my grumblings, this was still a charming little film that Disney fans will lap up a treat.